GRAND SPORTIF - Isotonic drink - Make your power felt! Welcome to the world of GRAND SPORTIF! A world where every moment counts. A world where performance is decisive. A world where balance is crucial. A world where hydratation is essential. 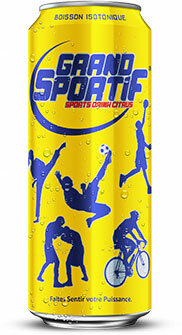 GRAND SPORTIF is the isotonic, refreshing, thirst-quenching drink which is ideal to reveal all your power!